Bolt Security Guard Services provides the ultimate security presence. BSGS is Arizona’s preferred commercial, community, and campus security guard service. Bolt continues to be recognized for maintaining some of the highest standards in the industry. The Bolt Security Guard Team is outstanding for several reasons: we carefully select, expertly train, and closely manage our officers in order to provide you with the safety you require at your site or in your community. Bolt Security Guard Services helps to maintain a safe and professional environment for your commercial property or office building. BSGS can work with building owners and managers to help enhance your security plan to keep your employees and assets safe. The presence of well-trained security officers is a critical factor in preventing loss, keeping unauthorized people off your property, and helping safeguard employees, tenants, and members of the public. Our security officers understand their roles and responsibilities. Communities and HOA’s have unique reception and safety needs for both residents and visitors. Our community professionals are trained to deliver the highest level of customer service, develop trusted security policies and procedures, and foster local police relationships through industry best practices. Our first priority is to help maintain a safe and secure environment for your residents. We will work closely with your team to customize a security concierge program that meets your community’s security and lifestyle needs. 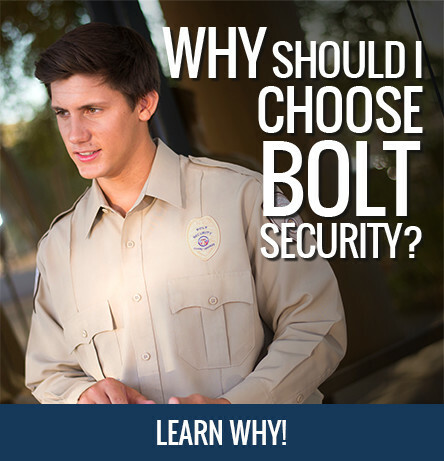 Bolt Security Guard Services has patrolled, secured, and protected hundreds of campuses across Arizona. Whether you are a public, private, or charter school, we ensure your campus is safe and secure, and that integrity of service is maintained at all times. Bolt provides security guard escorts, parking lot patrols, monitoring, alarm response, special event security, as well as fire watch services. Too frequently the news reports high-profile campus incidents – as your security service provider, we will work with you to help you be prepared for everyday problems, unexpected safety issues, and major incidents. 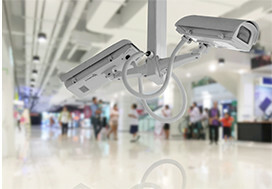 Through superior technology, we can design and implement a campus security solution to fit your specific needs. No two security situations are exactly alike. That’s why your security services program should be tailored to your needs. Bolt has been providing customized security officer solutions to meet the specific needs of clients large and small, for more than 15 years. What’s given us such longevity? It’s our ability to combine the right people, training and technology with the responsiveness of local and site management. Add to that an excellent customer service team and you’ll see why Bolt builds enduring client relationships. It all starts with understanding your specific needs, then building a security solution that not only meets those needs but anticipates issues. Armed security guards are the ultimate security presence. Armed guards provide an elevated level of service for an elevated threat or risk level, from protection of property to protection of persons. To become an armed guard in Arizona, a guard must already be licensed as an unarmed guard and then pass an intensive 16-hour course covering use of force, laws concerning the lawful use of firearms, and culminating in a strict live-fire firearms proficiency course.